I did a search on the forum but could not find it, I cannot for the life of me find how to forge, I have a 1* Barricade and a 2* Barricade but the forge button is greyed out, what am I doing wrong ? Ok, scratch that, that does not seem to work haha. Could we get some more clarification on how the forging actually works please ? Forging is basically selling a bot all it does is minimially increase baseline hp of bot being forged into. Does not require same bot to be done just a lower tier. For me it happened once I reached like 15 bots or so and managed to pull a 1-Star Barricade having a 2-Star one already. Thats when the Forge tutorial popped out for me. Thanks for the response Alkaiser. I guess it's a glitch or Kabam needs to update the information on their website. Oh no so once you forge you've lost your bot ???? Oh snap!!!!. Only Bots whose Tier is lower than the target Bot can be Forged. For example, a 4-Star Bot accepts 1-Star, 2-Star, or 3-Star Bots, but a 2-Star Bot only accepts 1-Star Bots. The same applies to Modules. Bots that are the same Tier cannot be Forged. You cannot consume a 4-Star Bot in order to power-up another 4-Star Bot. The same applies to Modules. The Forge feature should become available once your roster of Bots or Mods is large enough. You must own a minimum of 13 Bots or 8 Modules before Forging becomes available, and those Bots must be across more than one Tier. Hope this information helps out! Update: although bot forge will work as long as you have a minimum of 13 bots, it does not activate until after receiving 15 bots (as was stated by player Alkaiser_93). Unless this is a glitch, it would be helpful to have the 15 bot rule added to the forging page on Kabam's website. 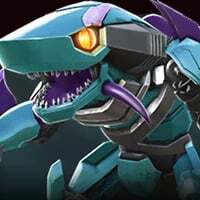 Perhaps what it needs to happen for the game to trigger Forge avaliable it's to have 13 bots or more and then pull out a previous tier of any bot you have on your team from any kind of crystal. Update: although bot forge will work as long as you have a minimum of 13 bots, it does not activate until after receiving 15 bots (as was stated by player Alkaiser_93). Unless this is a glitch, it would be helpful to have the 15 bot rule added to the forging page on Kabam's website. At least I can forge now. Oops, double posted again. Any know how to delete posts.